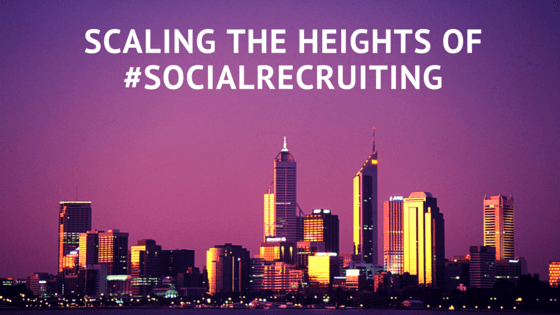 There are many different strategies that fall under the heading of Social Recruiting. The one that we're most intensively involved with here at Social-Hire is building a strong attraction strategy through social media. For some businesses the focus will be on candidate attraction. For others it'll be all about attracting potential recruiter clients. But whatever the focus, we consistently see 4 steps that clients need to implement to generate positive ROI from their social recruiting efforts. The first step sounds obvious but many businesses we speak with actually haven't had this conversation internally. The first key step is being very clear within your team about the audience you want to reach with your social media presence - and what you want your growing social media audience to have done several weeks or months down the line that will make them valuable for your business. The answer here will be different for different recruiting teams. Some will be focused on generating recruiter client leads. Others will want to drive an increase in candidate applications. Others will want to boost the search engine rankings of their careers site through stronger social sharing of their content. The key thing is to have actually defined your audience and goals at the outset so that all your social media activities are undertaken with these targets in mind. The second step is to think about what will make your profiles exceedingly valuable, entertaining and insightful to this target audience. Often recruitment businesses and recruiting teams are guilty of their social streams being nothing more than a parade of their latest job openings, plus maybe the occasional team photo or update about what the team is up to. If you want to become a magnet in your industry that attracts your desired target audience, this simply will not do. Essentially we want our social recruiting profiles to be like lead pages for our business. We want to tweak and optimise them so that a higher and higher percentage of people visiting our profiles choose to follow them - and get our updates on an ongoing basis. Do a poor job here and your social profiles might only achieve a 1% conversion rate. Do this well and you might see a 40% conversion achieved. Clearly it's not worth doing anything else to raise awareness of your social media profiles until you've plugged the holes in your conversion rate. Essentially you need to become an invaluable resource in your niche market, one that people will come to view as indispensable and whose updates they will want to share with others in their network. This is where the huge value on social media can be derived. For example, several of the accounts we manage have twitter followings of 35,000 to 50,000 followers. But when we look at the reach those profiles enjoy each month, their messages are actually seen by between 500,000 and a million twitter followers. Even with smaller accounts, a similar multiplier effect can be achieved if the right things are being done. It’s this network effect that gives your business and your recruiting team visibility amongst - and access to - the huge candidate audience that you want to reach. But this is only achieved when the updates you post are consistently valuable and share-worthy. The 3rd step is equally key. If all you do is Steps 1 and 2, you will have a social media presence that looks professional when people click to your profiles from your website. But you will not be growing an ever larger audience of candidates or clients who go on to do the things needed to fulfil your corporate objectives on social media (and so you'll fail if you stop here). That’s where Step 3 comes in. Step 3 involves understanding each of the social platforms where you have built a presence and figuring out the steps that are needed to get your profiles seen by more and more of your target audience. This requires consistent and informed activity across your social networks in order that your follower and fan base grows month on month. Last but not least, Step 4 involves engaging with your target audience on social media. This should mean reviewing the profiles of everyone who has interacted with your company on social media and following up accordingly. It may also mean discovering conversations taking place in your industry and jumping in and participating in those conversations. But essentially it revolves around taking that awareness that your recruiting brand now has on social media and turning it into meaningful conversations taking place with either prospective candidates or potential recruiting clients (or indeed both). For most recruiting teams, it’s this engagement that drives the overwhelming business value of having a strong social media recruiting presence. But you can't ever fulfil Step 4 effectively if you haven't already done a great job implementing Steps 1-3. If this sounds daunting and you'd like to pick our brains some more about what your business should be doing to leverage social media, we'd be very happy to help. We can provide an outsourced service to build your social recruiting presence or you can schedule a call to brainstorm what your next steps should be. You're welcome to book in a call time to get started - speak soon!